NY Brooklyn Bread Plain Bagel. Home style fresh. 6 Bagels. Plain, poppy, sesame, everything, cinnamon raisin, whole wheat. Trans fat free. No cholesterol. NY Brooklyn Bagels are baked fresh daily in our own ovens in Brooklyn, New York. Only those ingredients that have proved to be of the highest quality are included in our personally developed recipe. The NY Brooklyn Bagel tastes great whether they are eaten plain, toasted to a crispy brown, or covered with your favorite toppings. NY Brooklyn Bagels are the perfect change from your everyday sandwich breads. 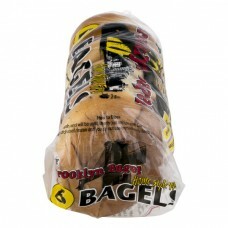 NY Brooklyn Bagels are better than all the other New York bagels which are acclaimed throughout the world. We believe that you, the consumer, deserve more than an everyday product. You deserve the best. For varieties: if sesame/poppy seeds added, contains sesame/ poppy seeds, if everything, poppy seeds, sesame seeds, onion and garlic, if cinnamon raisin, cinnamon and raisins, for whole wheat, equal parts of unbleached enriched flour and enriched whole wheat flour wheat-o-lax. How to store: If purchased fresh and will be used shortly just refrigerate. Can be frozen if desired. If purchased frozen and you do not use immediately keep frozen. Use for a sandwich: Slice bagel in half. Toast to desired crispness. If desired, top with your favorite toppings, cover the other half and enjoy. Use for pizza: Slice bagel in half. Cover each half with tomato sauce, cheese, and your favorite toppings. Bake at 400 degrees for about four (4) minutes or until the cheese melts. Use for Hors D'oeuvers: Instead of crackers, cut bagel in half then cut into wedges. Toast the bagel wedges and serve with your favorite toppings and dips.